You will love the amazing lake view from this 5 bedroom, 2 bath house located on a 65 acre lake in a private, gated community that sleeps up to 14. 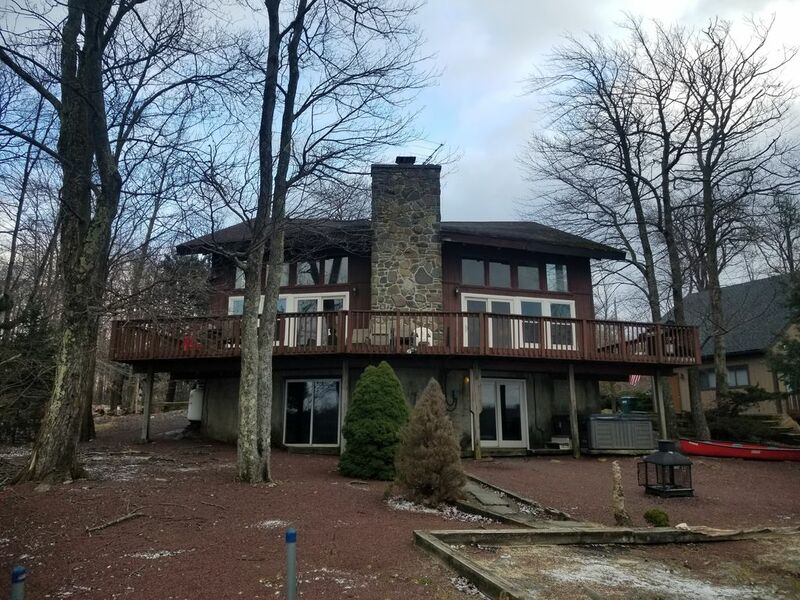 Relax in the 6 person Hot tub over looking the lake, enjoy the wood burning fireplace in the living room with 20 foot vaulted ceilings and panoramic views of the lake and 50" TV. First floor includes kitchen, breakfast bar, dining area, family room with 47' HDTV, wood burning fireplace, pull out sleeper sofa, reading area and 1 full bath. There is one Bedroom with 32 inch Roku Smart TV and Ceiling Fan. The Deck has a gas grill (propane provided) and seating. Second floor includes 4 bedrooms and one full bathroom. Bedroom 2 has a queen size bed, 32 inch Roku Smart TV and vaulted ceilings. Bedroom 3 has a queen size bed and 24 inch Roku Smart TV. Bedroom 4 has twin bunk beds, full size futon and 32 inch Roku Smart TV. Bedroom 5 has twin bunk beds, full size bed and 32 inch Roku Smart TV. Basement includes laundry room, pool table and walkout to Hot Tub and Lake. We provide access to a 4-6 person canoe during the summer. Walk to the private dock and beach in the back yard on the lake. Escape the cold and enjoy the the lake view from the 6 person hot tub. Community includes 2 lakes, 4 pools, beaches, tennis, basketball courts and playgrounds. Close to skiing, water parks, casinos, Pocono NASCAR Raceway, horseback riding, outlet shopping, hiking and other attractions. We only accept reservations from Family Groups or Qualified Adults where the leaseholder is at least 25 years old and must personally occupy the property for the entire rental period. We do not accept reservations from young adults under 25 years of age or if a majority of the group is under the age of 25. Close to skiing, water parks, casinos, Pocono NASCAR Raceway, horseback riding, outlet shopping, hiking and other attractions. We DO NOT provided linens (Bath towels or bed sheets) however if you need linen service let us know. Activities: Summer Activities (on site or nearby): Basketball, biking, boating, canoeing, fishing, hiking, horseback riding, hunting, golf, miniature golf, paintball, rock climbing, shuffleboard, spelunking, swimming, tennis, flea market and outlet shopping, water rafting and more. Only 16 miles to Camel beach Water Park and 40 minutes to Bushkill Falls for hiking. Also close to Pocono Raceway for NASCAR racing. Winter activities (on site or nearby): Cross county skiing, ice-skating, skiing, sled. Winter activities (on site or nearby): Cross county skiing, ice-skating, skiing, sledding hill, snowmobiling and more. Big Boulder, Jack Frost and Camelback close by for a great day of skiing and other outdoor activities. Casino (10 miles away), outlet and other shopping close by and available all year round. Beach and bath towels are not provided. Beautiful lake front property with ready lake access from the dock. Canoe provided with the property so you can enjoy paddling the lake. Comforters, pillows and kitchen towels provided. You must provide your own towels and sheets. One car garage good for storage of skis, bikes, etc. Cook top, wall oven, refrigerator, dishwasher, coffee maker and microwave provided. Everything you need to enjoy home cooked meals. 47 inch LCD HDTV in main living area. Another television is provided for video gaming. 6 person hot tub with excellent view of lake. Enjoy watching the day break, the sunset colors, and the birds in the trees or just relax on the deck that spans the entire back of the house. Relax in the brand new 6-person hot tub just a few steps outside the basement sliding doors at lake level. Paddle the lake in the 15 1/2 foot canoe. Exercise on the treadmill while enjoying the lake view from the second floor loft. The house has a full size pool table in the walk out basement, which is heated in the winter. The house includes a high chair and a pack-n-play. The house is 10 miles from the new Mount Airy Casino, horseback riding, and golf and just a 20 minute drive to NASCAR Pocono Raceway. The house is 16 miles from Camelback skiing in the winter and Camel Beach water park in the summer. Just 26 miles from Jack Frost/Big Boulder. Don't miss this one! Everything was as described in the listing. The lake was beautiful to look out over while we sat in the hot tub. The owner provided lots of information about local activities. We had a great time. This was a vacation like no other we've been on! I brought my whole family including my husband, daughter and son in law, my son and daughter in law and my 2 grandsons ages 2 & 3. This was truly a nature vacation! The kids loved the canoe everyday and feeding the deer in the yard and feeding the geese and ducks everyday. We visited the water park and the kids and adults had a blast! The Pocono Rocks was awesome too! This house was perfect for all of us, we had our space and enjoyed the large living room and hot tub and pool table. I definitely recommend this house and location to anyone who is looking for the perfect vacation. We love the beach but this is different and special! Great getaway for our family. This property worked well for our family, geographically and things to do. Lisa and Jay were great owners. Lisa in particular, was very quick to help with any problems we encountered, mostly with the community. Beautiful lake views and sunsets. Parks nearby. We enjoyed taking our canoe on the lake (didn't realize the owners had the exact same canoe already on the property. The house is a little older than the pics suggest, and could use a little freshening up, but it was solid, comfortable, and met our needs. Information about check in, check out, etc. (PROVIDED BY THE OWNERS) was excellent. I was personally not impressed with the information accessed through VRBO, as a lot of it (for me, a 65+ tech challenged person) was difficult and not at all intuitive. My wife kept asking questions such as how many and what size beds for the linens that we needed. The info provided AFTER completing the purchase was less helpful than the original ad for the house. Combine that with the additional charges, and I'm not sure we will book another vacation through VRBO. The house and the owners are worth the 5 star rating however. The cabin was large and was exactly as advertised. We saw tons of wildlife, including a black bear, deer every morning in the yard and even some fish out of the lake. You'll love the views from the deck overlooking the lake in this private, gated community. Just 2 hours from Philadelphia and New York City. Cast a line from the private dock, take a leisurely paddle up the lake in the canoe provided with the house, or just sit back, relax and enjoy the scenery on the private beach. There's plenty to see and do both in the community and the surrounding area depending upon the season. Enjoy skiing, snowboarding and snow tubing in the winter. The house is 16 miles from Camelback and 26 miles to Jack Frost/Big Boulder. In the summer enjoy the community beach and pool. Camel beach & Shawnee water parks are just a short drive away. Horseback riding & outlet shopping is available all year around. Ten minutes to the new Mt. Airy Casino. Don't forget the Nascar Pocono Races either! A Lot to do & see no matter the season. The fall and spring brings the splendor of the foliage. Don't forget your camera and hiking boots to fully enjoy nature at its finest!